Welcome to the official how-to guide to start or enhance a royal addiction. I never thought I’d be writing a post like this for the blog, but with today’s very exciting announcement of Baby Sussex on the way and an overwhelming response on Instagram to start Instastory-ing more about the royals, I thought giving a long form backstory to my royal fandom would be nice for you and for me. Let’s start at the beginning shall we. I have been obsessed with royalty since forever, I think this is partly due to the fact that I have gone to Disneyland since I was two, so real life castles with princes and princesses were bound to become an addiction at some point in my life. Being 10+ years younger than princes, William and Harry, put me at a slight disadvantage, so the royal anglophile in me didn’t fully emerge until November 10, 2010, when Prince William surprised the world by proposing to Kate Middleton, a commoner (this is the part where your eyes go wide and you cover your mouth with a gasp!). Since that day I have watched movies and documentaries, collected magazines and newspapers, stayed up all hours of the night to witness BOTH weddings, and live streamed all three of Kate’s births (you know I’ll be doing the same for Meghan in the Spring)! On top of that I have dressed up as Kate three times for school functions and wrote a 20-page paper senior year of high school, debating the purpose of the royal monarchy in a modern world. So yes, to say I’m addicted is an understatement. But you might be asking yourself, “Why I am so addicted?” As a huge history nerd I love that an establishment going back centuries is still relevant today in non-governmental respects. The traditions they have created for themselves and the world are fascinating. Like did you know that Queen Victoria (Queen Elizabeth II’s great-grandmother) popularized white for a wedding dress? She also was the one who started the royal tradition of kissing on the balcony of Buckingham Palace. For her daughter’s wedding Victoria noticed the crazy amount of people outside the Palace hoping to get a glimpse at the royal family on their big day. Victoria decided that by standing on the balcony for the momentous kiss where everyone could actually see them, would make the people feel like they were joining in on the celebration. To this day numerous couples have had their first married kisses on that balcony and the family stands up there during national events like Trooping the Colour. Another reason I am so addicted is because it’s fun! Every girl dreamt at least once of being a princess, so seeing real life royalty marry non-royalty is kind of like watching our dreams come true. Now that an American, Meghan Markle, has officially joined the Royal Family, my devotion for them is even stronger! I mean how cool is it that the next royal baby will be a quarter African-American with a grandmother who is a yoga teacher in Los Angeles?! If someone would have told this to the Queen even ten years ago I think she would have fallen off her thrown and spilled her tea all over the Buckingham Palace carpet. Because Meghan is an American, US tabloids and newspapers are covering the royals a lot more than they used to and for that I am truly grateful, but to amp up your own personal knowledge of the royals you need to do more than pick up an issue of People every once and a while. So for that I give you my five favorite royal instagram accounts. These two are clumped as one because they are the official Instagram accounts for the family. 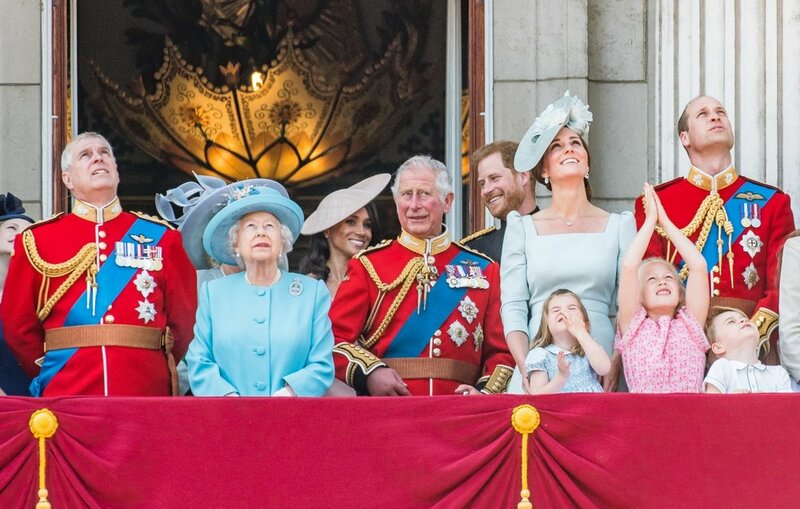 @theroyalfamily covers the Queen, Prince Phillip, Charles the Prince of Wales, and his wife Camila the Duchess of Cornwall, as well as big family announcements like weddings and babies. @kensigntonroyal covers the Fab Four — Prince William and Kate Middleton the Duchess of Cambridge (a.k.a “The Cambridges”) and Prince William and Meghan Markle the Duchess of Sussex (a.k.a. “The Sussexes”). These accounts are great to learn first hand about royal engagements, charities that the royals are patrons of, and more. The Fugg Girls, Heather and Jessica are the founders of the website GoFugYourself.com, which covers fashion and media and LOTS AND LOTS OF ROYALS! These ladies are obsessed with the family. So much so they wrote a fan-fiction book based on William and Kate’s love story called, The Royal We (it’s SOOO good!). They give great commentary on the fashion of the royal women specifically and are always up to date with the goings on with lots of dry humor. This is my favorite fan account dedicated to the royals, particularly Meghan, Harry, Kate, and William. The girl who runs this account is ON.TOP.OF.IT. She gets multiple photos, videos, and more of every outing the royals undergo and posts them in real-time. This account is the first place I check when I want to see alllll the details. My last pick is another set: two illustration accounts. I discovered both of these talented ladies during Meghan and Harry’s wedding and have been obsessed with their work since! They are very quick to put up one or more beautiful sketches of the couples or ladies whenever there is a new event. It’s a fun and unique way to enjoy the royals. I currently own three products from @iamnoyes’ royals collection. This rainbow phone case of the Queen, and this mug and this mug from H&M’s wedding. If you have a friend who loves the royals, I highly recommend looking at these two accounts for Christmas gift ideas! AMAZZZINNG movie with Helen Mirren playing Queen Elizabeth! It focuses particularly around the time Diana was part of the family and how the family dealt with the scandals and her death. Fantastic documentary voiced by Diana herself to royal biographer Andrew Morton. She speaks about the entire length of her life from growing up in the Spencer family to her separation from Charles. She speaks in great detail of the brutality inwardly and outwardly she felt joining “The Firm” (a.k.a. the Royal Family) and how it affected her life day to day. You’ll be shocked when you hear her speak of the things she knew of Charles’ affair with Camila and more. And you’ll cry hearing her speak about her boys, not knowing that only a short time after she spoke to Andrew Morton, she would be dead. This PBS Masterpiece show centers all around Victoria’s ascension to the throne at the young age of 18, her love story with her husband Prince Albert, and her unique way of handling herself among her much older male advisors, who did not think she was fit to be Queen at all. If anything, watch this show for the costumes, they are astounding! I can’t mention the Royal Family without mentioning the multiple award-winning tv show, The Crown. If you haven’t watched it, what are you doing with your life? Claire Foy as the Queen is brilliant, Matt Smith as Prince Phillip is mind-blowing, and Vanessa Kirby as Princess Margaret is addicting. My favorite favorite favorite royal podcast to listen to is Royally Obsessed. Hosted by two writers Lisa and Kaitlin who are as obsessed as I am if not more with the royals, bring a fun episode each week filled with fun topical history, refreshments, fashion, and more! I particularly love them because it’s like sitting at a lunch with two friends talking so intensely about the royal family it might actually border on creepy (lol). Follow these accounts, watch these movies and more and in no time you’ll be as royally addicted as I am.